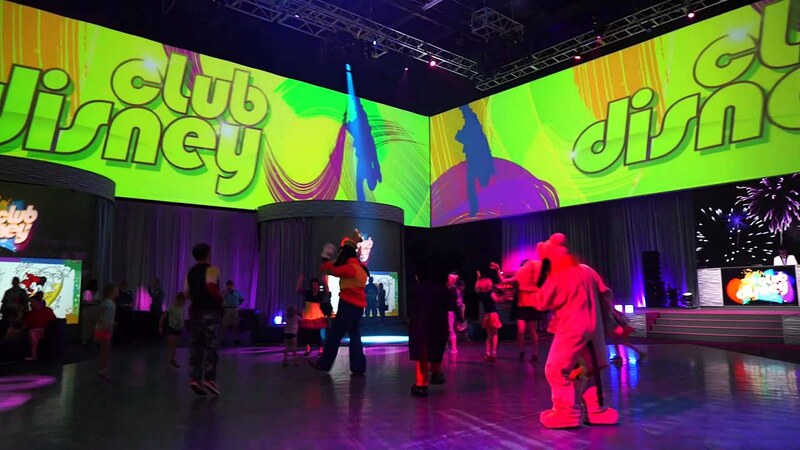 Dec 01, 2015 in "Club Disney"
Disney's Hollywood Studios has a new Character Dance Party - and it's indoors, air-conditioned, and has a place for parents to relax while the kids dance. Sunset Showcase is the new flex-space theater at Disney's Hollywood Studios, and is now home to Club Disney. You'll find it just off Sunset Blvd, with entry from the Rock n RollerCoaster Courtyard. The new space features 360 degree video screens surrounding the dance floor, with a DJ running the show from a stage and playing a mix of top 40 pop hits. Characters join in the fun, with Mickey, Minnie, Chip & Dale, Donald, Daisy, Goofy and Pluto all appearing throughout the day. Club Disney also features some neat interactive elements, where kids can try their hand at painting some animated scenes with digital paintbrush (with technology borrowed from the recent Colortopia at Epcot's Innoventions). There is seating around the room, charging stations for phones, snacks and beverages on sale, and a full restroom. The menu includes Mini Corn Dog Bites in a souvenir Mickey Elf Bucket for $13.99, Club Mickey Sandwich with chips and beverage for $5.99, Mickey Pretzel $5.59, Goofy or Minnie Cupcake $5.59, Mickey Brownies $4.19, and Cotton Candy with Glow Cube $7.29. Club Disney is open daily from 9:45am through to 8pm.